CBD, or cannabidiol, is a prevalent chemical compound found in the cannabis plant. It can be legally derived from industrial hemp in the form of an oil. As CBD continues to grow in popularity, you may be interested in trying it for yourself. There have been many studies on the benefits of using CBD oil as a part of your daily routine. But what are the side effects of CBD oil? 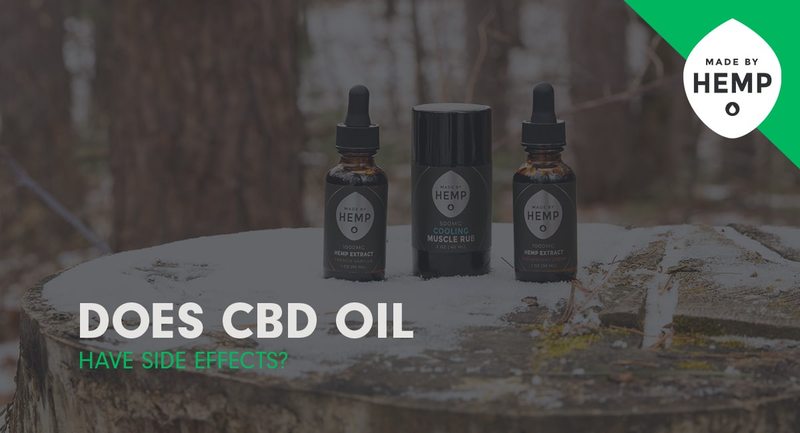 At Made by Hemp, we’ve mentioned the many benefits of CBD and want to completely inform our customers on everything CBD related, so we will talk here about CBD Oil side effects. Although research is still in the beginning stages, there have been few side effects of CBD oil reported. It is important to note that CBD oil does not have the intoxicating properties that are found in THC. Overall, CBD oil is considered a safe supplement to take. Excessive use of CBD has little-known side effects. In higher servings, it has reportedly caused drowsiness and digestive upset. We recommend following the serving size for each product. CBD hemp oil can be used for many purposes. Whether you are new to CBD or a seasoned consumer, we carry a range of products to assist you with your wellness goals. CBD oil can be taken in its purest form or mixed with other ingredients. Often, we will use natural ingredients, such as coconut oil and terpenes, to mask the hemp flavor. CBD oil can be vaped, taken sublingually, or eaten in the form of an edible. It is also a beneficial ingredient in skincare. As the popularity of CBD continues to grow, more studies emerge on the benefits of its use. This cannabis extract has been studied closely because of its many benefits and few side effects. Unlike the cannabinoid THC, CBD does not have any psychoactive properties. Due to this, CBD oil is considered a safe supplement to use every day. CBD works with our endocannabinoid system, which is responsible for keeping the body in homeostasis. CBD regulates the endocannabinoid receptors, which are located in the brain and throughout the central and peripheral nervous systems. Endocannabinoid receptors assist with control of appetite, pain, mood, and memory. As with any health supplement, the quality of your CBD oil can make a difference in the side effects that are experienced. At Made by Hemp, we are particular about the products that we choose to sell. Our CBD oil products are made with CBD derived from domestic hemp plants. Once extracted, the oil is lab tested and sent to our Michigan facility. With the signing of the new 2018 Farm Bill, all CBD products derived from hemp are legal in the United States, you won’t have to worry about any legal side effects when you use our products. We send one gram of the CBD oil out to be tested by a third-party lab. They test for any impurities and ensure both quality and safety. Only once the oil passes through this testing is it used to produce our products. As always, we encourage you to do your research before you buy. We are not medical professionals and do not intend to treat or prescribe. If you have any specific questions pertaining to your health, it is best to consult a doctor.